Ah the sandwich. One of the most simple yet fluid concepts in food. Food has long been enveloped or contained in some sort of bread in various cultures across the world, but the actual word can be traced to 18th century England. Edward Gibbons states that John Montagu, the Earl of Sandwich, would ask for his meat to be between slices of bread, so he could eat with his hands while playing cards and not get the cards dirty. Eventually, people began to ask for their meals, “The same as Sandwich”, and a new word entered the English language. Today, there are a million ways to put one together that range from the classic peanut butter and jelly to the straight up bizarre. 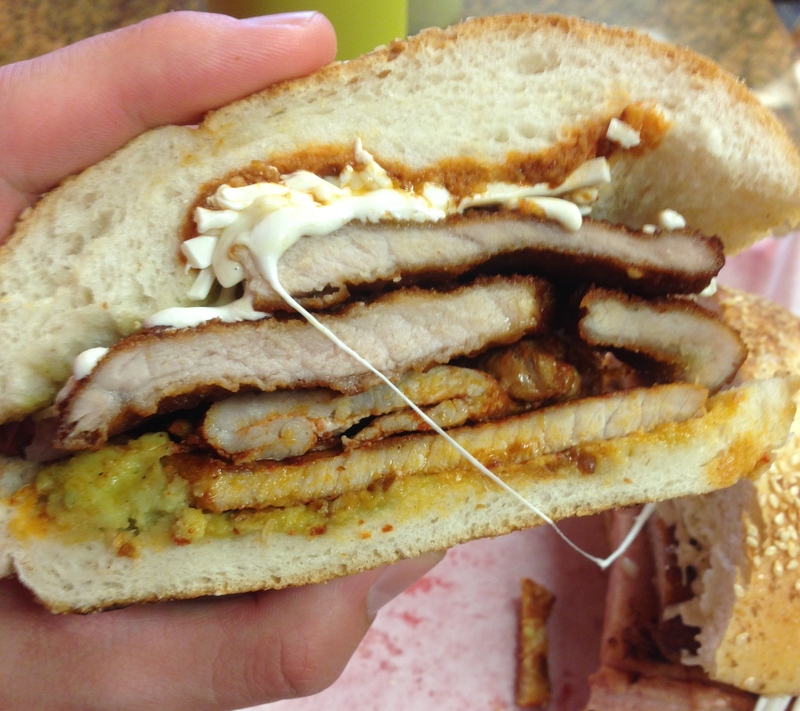 Today’s edition of Mastication Monologues features a Mexican twist on the food staple in the form of Cemitas Puebla in Chicago. This eatery in Humboldt Park has received its fair share of publicity after appearing on the Food Network, PBS’s Check Please, and the Hungry Hound a.k.a. Steve Dolinsky from ABC 7 news. 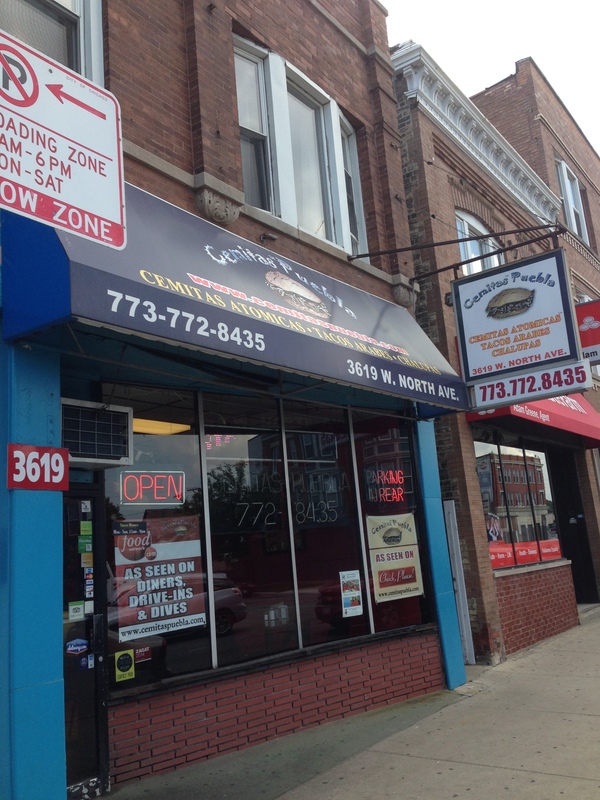 Surprisingly, given that this West side establishment is located in the heart of Chicago’s Puerto Rican community, it is purely Mexican, specifically from the state of Puebla. The exterior blends into the neighborhood, and the interior is just as simple. I went there around lunch, and it was hopping. The line was moderately long, but the cooks knew how to hustle. Looking over the menu, the cemitas were dominant, but there were other dishes like tacos, enchiladas, chalupas, and quesadillas to name a few. 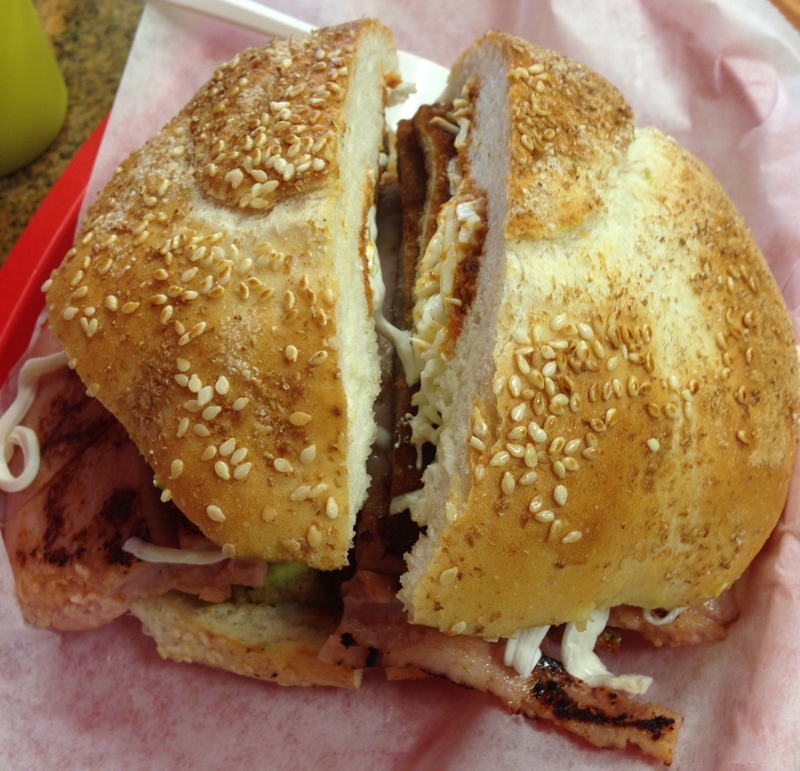 I was determined to see what made these south-of-the-border super sandwiches were made of. I decided to speak in Spanish with the lady at the cash register to maybe get a bit of extra info that the gringos wouldn’t get. I was torn between the pata (cow foot) or the atomica (atomic) cemita, but the lady recommended the atomica because the cow foot wasn’t very popular and lower quality. Taking her word for it, I put down $9 for the atomica cemita and a small agua de jamaica to drink ($1.25). While waiting for my meal, the cashier got my drink from the back freezer along with a couple of squeeze bottles. She set them down, and I asked about the different salsas in the bottles. 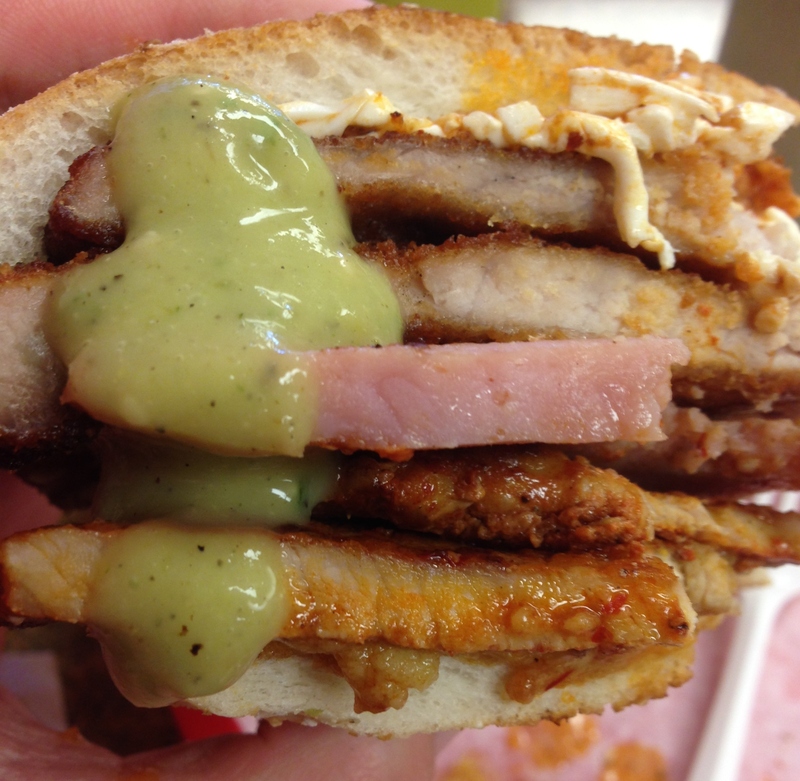 While the two clear ones were filled with some sort of red and green sauces, the woman pointed out the bright yellow bottle of sauce would go the best with the cemita. I thanked her for the info started sipping on my drink. 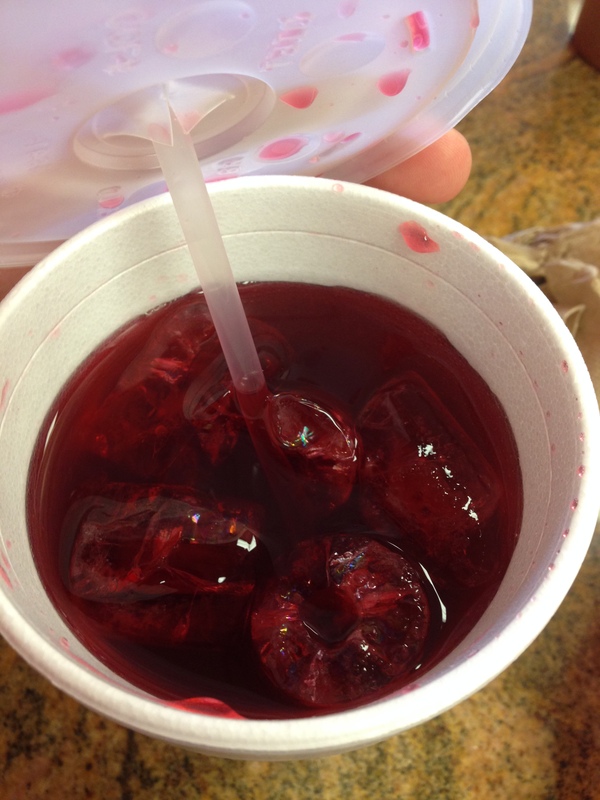 Agua de jamaica (literally: water of hibiscus) is a tea that can be served either hot or cold, the latter in this case, and is an infusion of hibiscus flowers and a bit of sugar. It’s a great drink for a hot day with a hint of sweetness in each sip, and it has anti-oxidant properties that can lessen the effects of hypertension. Finally, the star of the show emerged from the grill, and was brought to my table with minimal fanfare. I was taken aback by how large the sandwich was for the price I paid and then pondered how to tackle this monstrosity? The atomica consisted of breaded pieces of milanesa (breaded pork), carne enchilada (chili seasoned meat), and jamon (ham). This meat parade was further accented with adobo chipotle peppers, Oaxacan cheese, and fresh papalo or a green herb used for seasoning. I took my first bite that consisted me of unhinging my jaws like a reticulated python around a baby hippo, and it truly was a weapon of mass deliciousness. The bun was moderately toasted with a generous sprinkling of sesame seeds on top, and it was strong enough throughout the meal to keep these ingredients in check and not on my pants. Each layer of meat moved from strength to strength as the jamon was salty to compliment the milanesa breading while the breading provided a crunchy contrast to the soft carne enchilada. I loved the stretchy Oaxacan cheese that was plentiful along with the chunks of creamy avocado. The papalo was there, but I personally didn’t think it brought much to the table flavor and texture-wise. 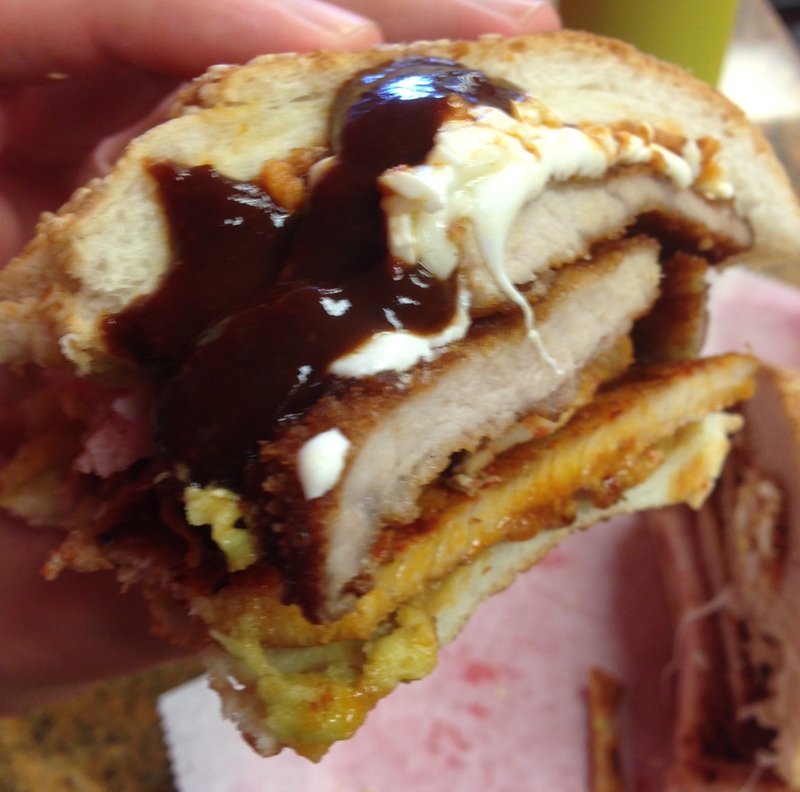 Once I was acquainted with my new sandwich friend, I decided to try some of the sauces on the table. I began with the recommended cemita sauce, and it was a peppery adobo that had a robust, peppery bite to add a savory dimension to the sandwich. I moved on to the green sauce that had an uncanny resemblance to boogers, but it thankfully didn’t taste the same. I’d liken it to a flavorful tomatillo salsa with hints of cilantro. As for the red sauce in the other clear bottle, it was nothing noteworthy. ‘Twas just another run of the mill tomato based salsa. Much to my dismay, I wasn’t overly stuffed even though the sandwich probably had over 3,000 calories and could choke a horse. It was a simple yet thoroughly satisfying lunch. So if you want to try a unique piece of Mexico beyond tacos and tamales for a reasonable price, check out Cemitas Puebla.